TTT – Tiny Thumb Thursday – ??? What the hell is this? They are tiny, fuzzy, pollen-like flying insects/bugs, and there are so many around here that it looks like it’s snowing! When you go outside, you are immediately covered by them. They are on your clothes, in your hair, and in your mouth or nose when you breathe. They look cute, but there are too many of them. Any ideas? This entry was written by Chaos, posted on September 2, 2010 at 2:56 pm, filed under Random and tagged cute, flying insects bugs, fuzzy, small animals, thumb, Thursday, tiny, TTT. Bookmark the permalink. Follow any comments here with the RSS feed for this post. Post a comment or leave a trackback: Trackback URL. 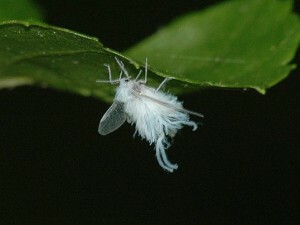 they are wooly aphids…the white is a waxy kind of wing… me and my sister saw them ans we thought they were faries then we reserched!